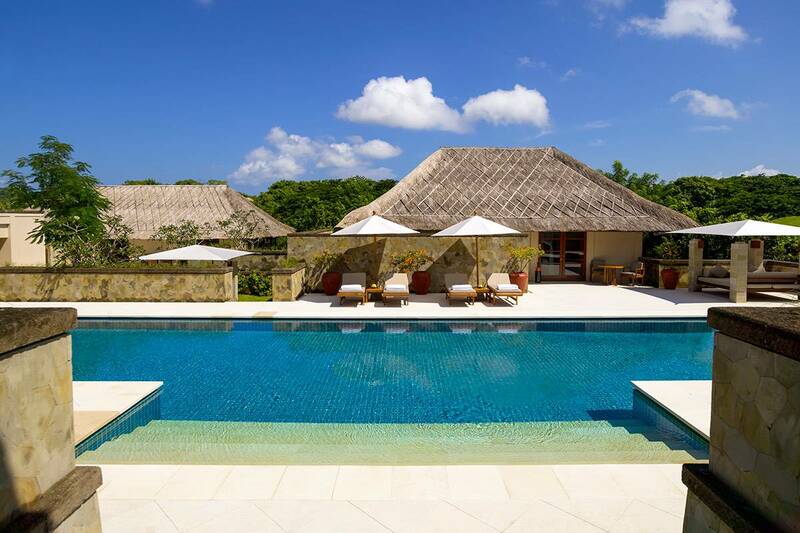 Each villa at the resort is located on approximately 4,000 square metres of land and offers three or more bedrooms and a private swimming pool. Whilst the structures that make up each villa compound are identical, the villas are differentiated by the positioning of the buildings to embrace views, respect natural terrain and vegetation, and to protect the privacy of the villa. Typically, arrival to each villa is via a forecourt that contains a double garage and a vestibule that opens to the villa landscape. There is a central two-story structure that provides two guest bedrooms on the lower level, separated by a gallery and a staircase leading to an upper level. Here one finds a lounging and dining area with beautiful open views on either side of the central stairs that lead down to the swimming area. 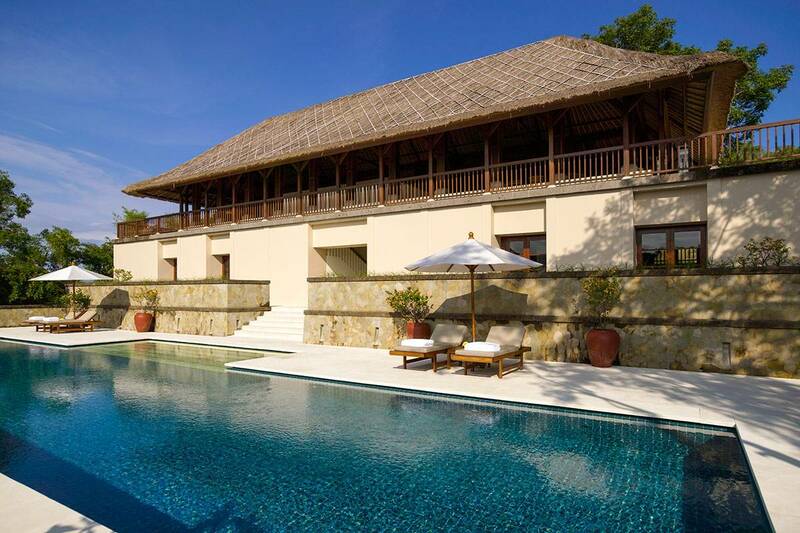 A generously-proportioned swimming pool lies at the heart of each of the Villas, surrounded by a terrace with sun beds. Leading onto the pool terrace is a guest bathroom and shower, and beyond in the garden is a large open-air dining pavilion which can accommodate up to 10 diners. Rounding out the central facilities is an air-conditioned library which provides lounging and home theatre opportunities. Walkways through the landscaped gardens link the main facilities to the other guest bedrooms, as well as the master suite. The master suite is larger than the guest bedrooms and offers a lounging area as well as an expansive terrace. All the bedrooms feature spacious en suite bathrooms and a number also offer outdoor bathtubs and showers. Completing each Villa is the service building which houses the kitchen, laundry and staff accommodation. 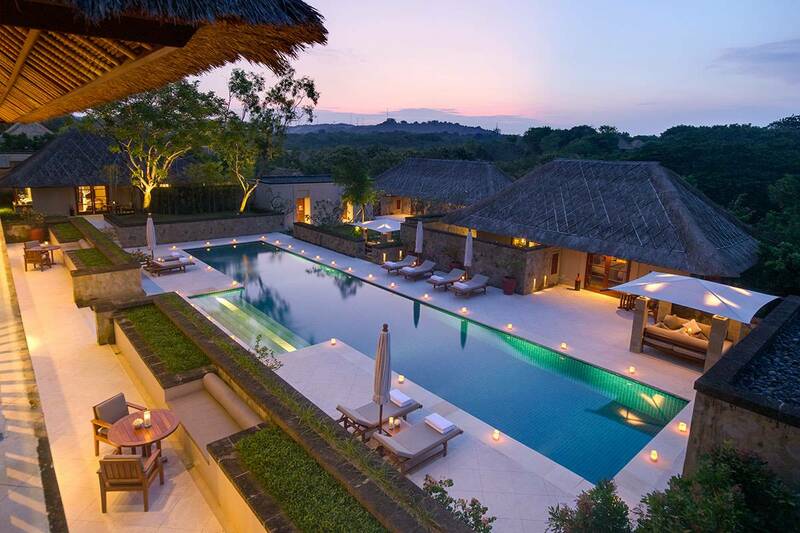 The resort sits on a garden hillside in southern Bali. Just beyond, the Bali National Golf Club stretches towards the Indian Ocean, while close by are the bougainvillea-shaded streets of Nusa Dua, lined with roadside shops and resorts. The international airport in Denpasar, the island’s capital, is a 20-minute drive from the resort. Renowned for its dining, nightlife, shopping and entertainment, the coastline of southern Bali offers myriad opportunities for exploration. 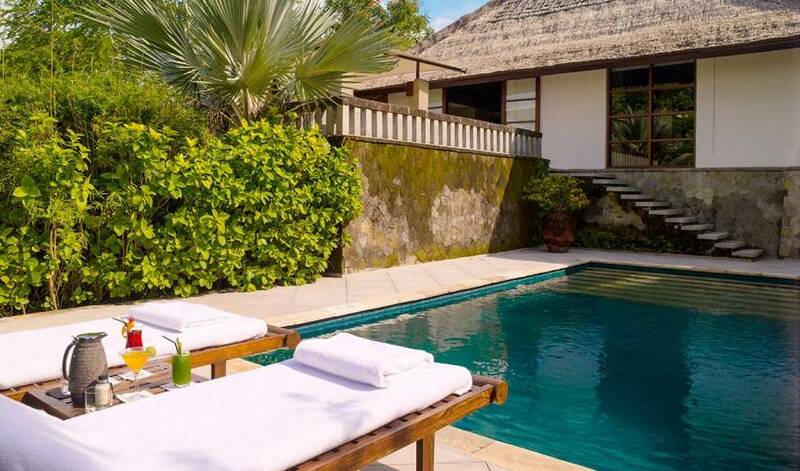 From the chic towns of Sanur and Seminyak to the beaches of Nusa Dua and Kuta, guests can experience the vibrancy of “new” Bali from a tranquil base at the resort. Bustling streets are lined with shops selling colourful textiles, wood carvings, jewellery, stone sculptures and paintings, reflecting the artistic traditions of the island. Roadside stalls offer traditional Indonesian fare such as spicy fried rice and fish or chicken satay. Along the white sand beaches, fishing boats, dramatic sunsets and arching palm trees provide endless photo opportunities and the overall atmosphere is one of welcome. This region, with the resort at its heart, offers an exciting opportunity to glimpse how the contemporary and the classic are intertwined on this legendary island. This is located on the beachfront of the Bali National Golf Resort. The Club consists of nine bales, each with two sunloungers. Refreshments, light meals, showers and washrooms are provided. The white-sand beach is one of Bali's best and is fringed by a coral reef. Snorkelling equipment and kayaks are available. The Beach Club is also the setting for candlelit barbecues, and sunrise breakfasts can be enjoyed in the privacy of the bales. Just 20km offshore and visible from the resort on the horizon are the islands of Nusa Penida and Nusa Lembongan. There are a variety of craft, including a luxury catamaran that can be chartered to visit Nusa Lembongan, which is the more secluded of the two islands. This full-day excursion might include a lunchtime barbecue, exploration of the beach and beach volleyball. Bali’s golf courses are as diverse as the island itself. The resort offers guests complimentary use of its golf clubs. 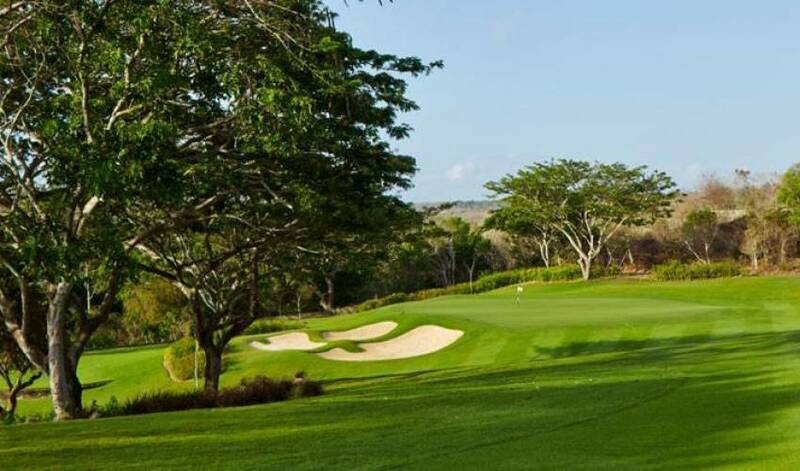 The newly-renovated Bali National Golf Club, recognized as one of Asia’s top five courses, lies adjacent to the resort and offers a driving range, putting and chipping greens and a pro shop. Designed by Robin Nelson and Rodney Wright, the championship 18-hole course enjoys a scenic seaside setting. The guests will enjoy a priority reservation system at the course and may sign all charges to their account. 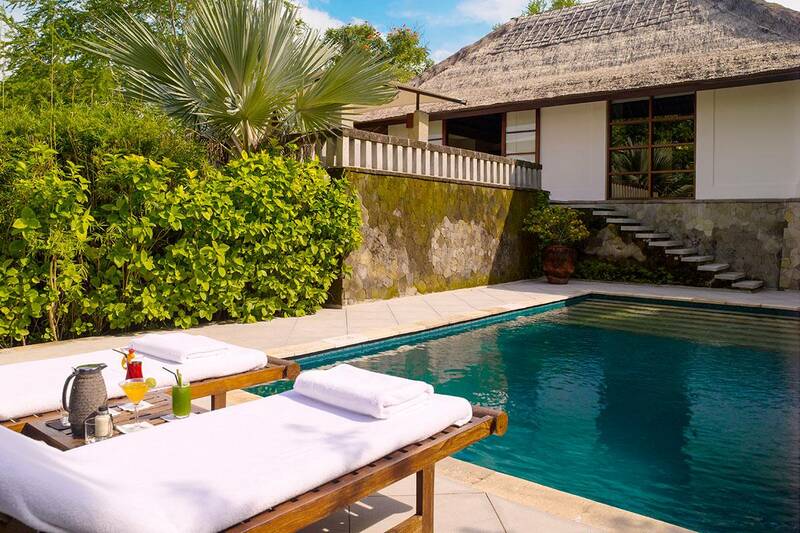 New Kuta Golf lies just south of Jimbaran, 30-minutes’ drive from the resort. An 18-hole champion-standard course and the first links style layout in Indonesia, it will challenge both the low-handicapped and reward the novice. With five sets of tees, there’s enough variety to ensure a satisfying experience for all skill levels. 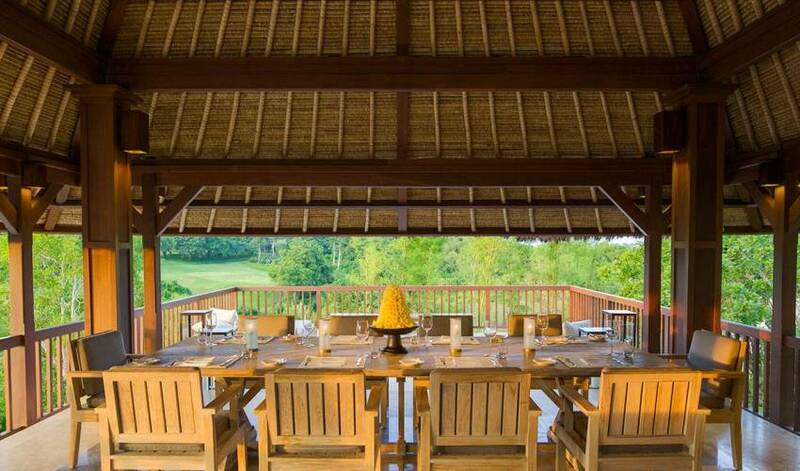 The Nirwana Bali Golf Club, an hour and a half’s drive located in the Tabanan Regency on the island’s west coast. Former British Open champion Greg Norman designed the championship course. Offering one of Asia’s most visually arresting settings, the Nirwana Bali Golf Club plays through rice paddies, tropical forest, gardens and creeks. 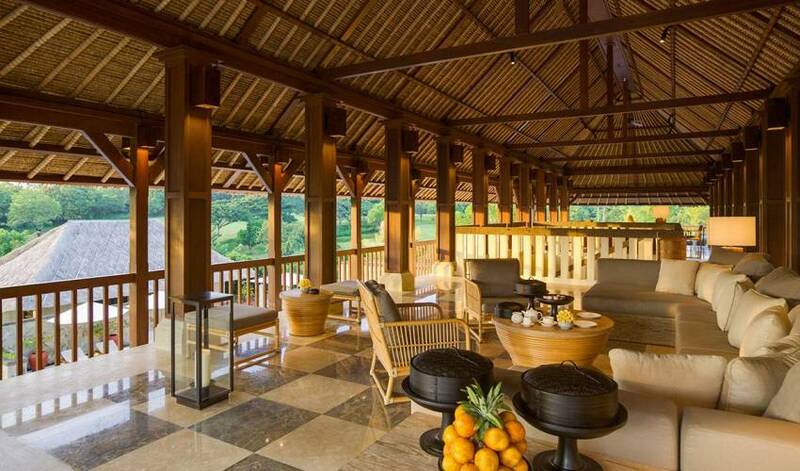 Two and a half hour’s drive is the Bali Handara Country Club is set in an extinct volcano. Acclaimed as one of the world’s most beautiful golf courses, it was designed by Peter Thomson and Graham Wolveridge. The championship course’s 18 holes lie amidst mountains and rainforest, and its lush green fairways overlook distant Lake Buyan. 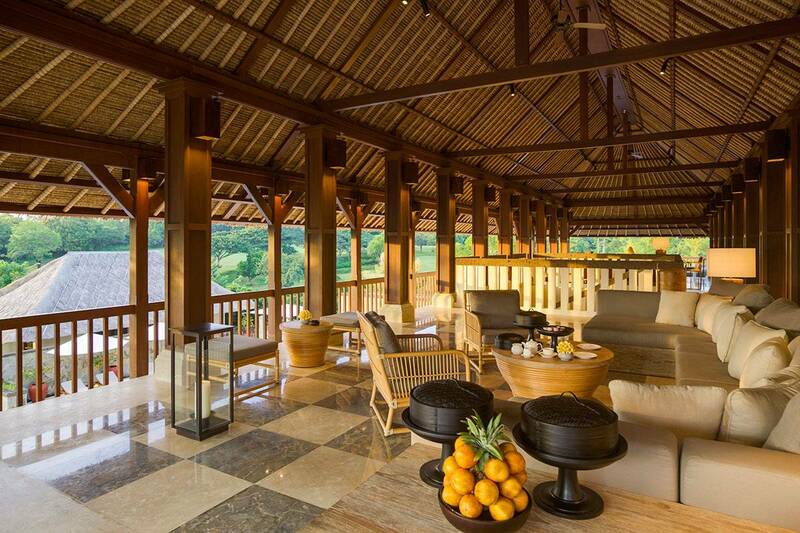 The resident masseuses mix traditional Balinese massage with Swedish massage and acupressure. Massage is available in the privacy of your suite, in the specially-designated massage suite or on one of the Beach bales. A variety of body treatments includes the two-hour Balinese lulur body scrub, a traditional exfoliation and body polishing treatment which concludes with a Balinese massage and luxurious herbal bath. Beauty treatments using natural organic products unique to the resort include facials, pedicures and manicures. A Reiki master is on hand to redress any energy imbalances and a reflexologist is available once a week. 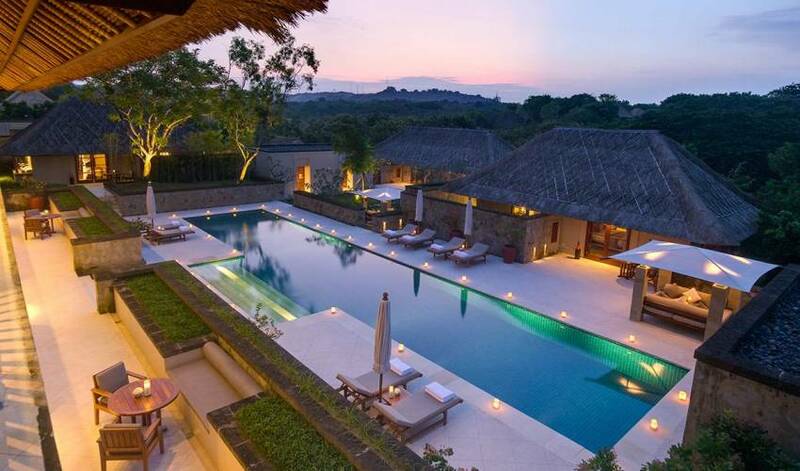 Bali is located at the heart of the Indonesian archipelago. 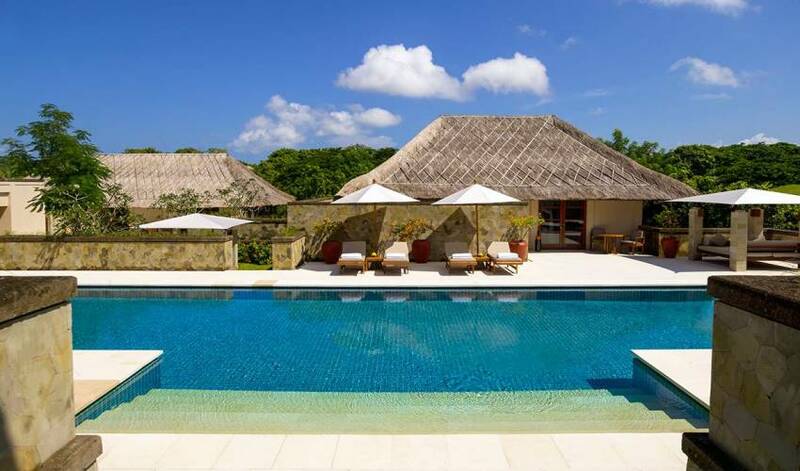 Its north coast faces the Bali Sea, while the southern coast is lapped by the Indian Ocean. The island is just two kilometres off the eastern tip of Java. For all its cultural richness, Bali is a small island, less than 150km from east to west and only about 80km north to south. Bali has nearly three million people, most of whom still live in villages and small towns. Bali’s unique variant of Hinduism influences every aspect of island culture, from day-to-day village life to art, dance and music. Bali is one of the most accessible destinations in Southeast Asia, with daily flights from most major cities in Asia and Australia. Travellers from the United States or Europe tend to fly via Singapore or Hong Kong. There are also domestic flights and ferry connections from the surrounding Indonesian islands. 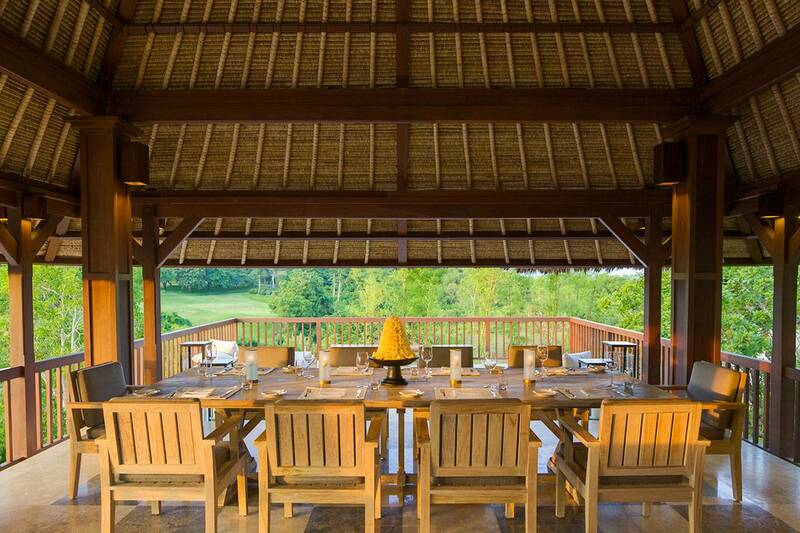 The resort is 20 minutes away from Denpasar airport, and is within easy reach for multiple resort breaks.